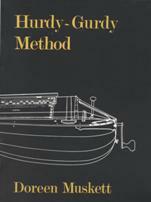 Doreen Muskett’s Hurdy-gurdy Method, first published in 1979, has proved of immense value to players all around the world. The third edition, revised by Michael Muskett, improves still further a book that already stands as an exemplar for instrumental methods. The CD was produced for the 2nd edition but the musical text is much the same, with most of the tunes given in the exercises being on the CD also. A correlation chart is provided.